Atria/Emily Bestler Books, 9781501180811, 416pp. An intoxicating thriller that cautions against the seduction of absolute power and those who would do anything to achieve it, The Terminal List is perfect for fans of Vince Flynn, Brad Thor, Stephen Hunter, and Nelson DeMille. Jack Carr is a former Navy SEAL who led special operations teams as a Team Leader, Platoon Commander, Troop Commander, and Task Unit Commander. Over his twenty years in Naval Special Warfare he transitioned from an enlisted SEAL sniper to a junior officer leading assault and sniper teams in Iraq and Afghanistan, to a platoon commander practicing counterinsurgency in the southern Philippines, to commanding a Special Operations Task Unit in the most Iranian influenced section of southern Iraq throughout the tumultuous drawdown of US Forces. Jack retired from active duty in 2016 and lives with his wife and three children in Park City, Utah. He is the author of The Terminal List and True Believer. Visit him at OfficialJackCarr.com and follow along on Instagram, Twitter, and Facebook at @JackCarrUSA. "Absolutely awesome! So powerful, so pulse-pounding, so well-written – rarely do you read a debut novel this damn good." "Told with a deft hand and a keen eye for detail, THE TERMINAL LIST . . . is explosive and riveting." "An extremely unique thriller! Absolutely intense!" "Like a bullet from Jack Carr’s custom built sniper rifle, the story arrives on target with devastating impact. Trust me, you won’t be able to put this one down!" "THE TERMINAL LIST is a thrill from start to finish! Let's all hope this is the first of many from Jack Carr." "Bravo! Jack Carr is the real deal!" "Crackerjack plotting, vivid characters both in and out of uniform, and a relentless pace. to a worthy finish. It's a great start!" "If you are a fan of Vince Flynn or Brad Thor, make room on your nightstand - Jack Carr has arrived!" "THE TERMINAL LIST bleeds with gripping authenticity . . . Think Vince Flynn's TERM LIMITS meets Mark Greaney's BACK BLAST." "Hands down one of the best books I’ve ever read!" "Absolutely riveting! Carr's experience and expertise shine on each and every page." "Not since Stephen Hunter have we seen an author who so accurately captures the essence of the gun–Jack Carr is a shooter." "The author blends his unique perspective having ‘been there and done that’ into a writing style that pulls no punches. A must read and a no nonsense writer to watch." "Jack Carr is an amazing author! As a former Navy SEAL himself, Jack has created the main character, James Reece, to be a modern day American hero and dissolve a conspiracy that runs to the highest level of government! It’s truly a thriller." "The Terminal List is nothing short of a runaway train on fire, heading down a steep hill with no brakes, and as the very eager reader, I did not want to get off. Worth 5 sniper-precision stars!" "Jack Carr's The Terminal List is a page turning thriller you won't be able to put down. The detail-focused writing, personal characters and heart pounding plot line will keep you coming back for more. An absolute must-read!" "Any fan of the novels by Brad Thor and the late Vince Flynn will realize that Jack Carr will soon be joining their ranks. THE TERMINAL LIST is sure to be the best debut thriller of 2018." "There have been many inspiring books by SEALs about their life and career. With The Terminal List, readers get the inspiring story within an action-packed plot." 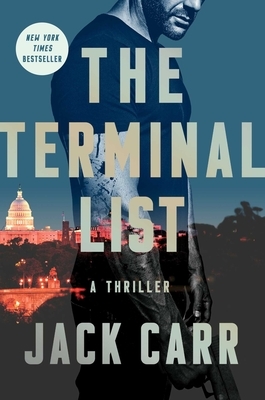 "Without question, Jack Carr's The Terminal List is the most daring, controversial debut political action thriller since Vince Flynn's iconic novel, Term Limits." "Carr's novel is a strong cocktail. The Terminal List combines a shot of Vince Flynn's Term Limits with a dash of Stephen Hunter's Point of Impact, tosses in a sprinkle of the movie The Fugitive, and mixes it all together with the visceral vengeance of David Morell's First Blood. "The best ending to a novel I've ever read!" "This is one of the best thrillers of the year and highly recommended."